Thrive Market is a membership e-commerce platform on a mission to make the world’s highest quality natural and organic products affordable for every American family. Thrive Market members can shop over 4,000 of the best – selling health and wellness items at up to 50% off retail price, delivered to their door. 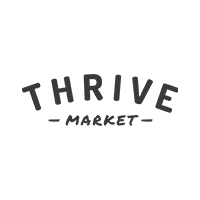 Each paid membership on the site, Thrive Market also sponsors a free membership for a low-income family.